Midland/Odessa again led the top 150 U.S. markets for annual rent growth in 3rd quarter 2018, posting a monster rent hike of 31.9% in the past year. The West Texas market has led the nation each quarter since 2017’s 2nd quarter, when rents grew 17.4% annually. However, in each of the previous eight quarters, Midland/Odessa ranked dead last – and by large margins – as apartment operators there slashed prices. Needless to say, rents in Midland/Odessa are extremely volatile. 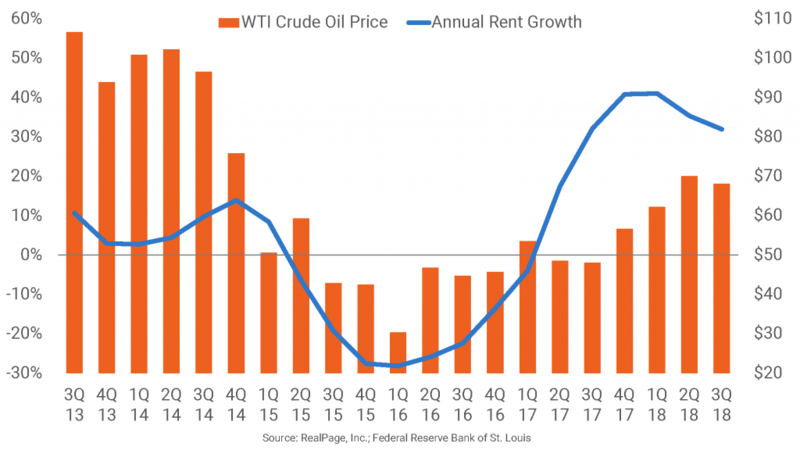 The market, the epicenter of the Permian Basin oil field, is dominated by the energy industry, and local apartment performance tends to track oil prices – which have been quite volatile in recent years. Jay Board manages analytics content for RealPage, Inc. He serves as chief editor for RealPage Analytics blogs, market reports and other publications, focused on delivering accurate and insightful commentary on apartment performance as well as economic and demographic trends driving the market. He works with the market research, analytics and data science teams to provide expert analysis of current conditions and underlying fundamentals in the national and local conventional and student apartment markets. Since joining RealPage in 2010, Jay has worked as an apartment market analyst, writer and editor. Prior to joining RealPage, Jay was a reporter for the Fort Worth Star-Telegram. Jay is a Dallas native and graduate of Texas A&M University. Previous Article: Who are Today’s Apartment Renters?